Goat meat is certainly one of the foods that are very familiar to the people of Indonesia. Satay, curry goat, goat tongseng are several types of foods prepared from mutton. Around the world, goat meat is also one kind of red meat most widely consumed throughout the world. Goat meat is sometimes has a bad reputation because it can increase cholesterol or high blood pressure. But beyond that, mutton has several health benefits. Here are some of the benefits that can be obtained by eating mutton as reported by Health Me Up (07/03). Goat meat is claimed to reduce the risk of coronary heart disease. Although saturated fat, but goat meat could reduce the risk of inflammation and heart rate more stable. Goat meat is a good source of food for the CLA, is a fatty acid that can prevent cancer and other inflammatory conditions. In the goat meat also contained vitamin B that can burn fat. Compared to other meats, goat meat contains more protein and saturated fat levels lower. Because it actually mutton good for weight control and reduce the risk of obesity. Goat meat contains selenium and choline are good for preventing cancer. Pregnant women are better eating goat meat to prevent anemia. Meat goats will give intake on maternal hemoglobin and increases the blood supply to the fetus in the womb. Enter the goat meat in the diet during pregnancy to prevent birth defects in babies. Mutton provide iron intake for women who menstruate. Not only that, mutton can also be used to relieve pain during menstruation. Since the number of vitamin B12 in it, mutton would be a good food to nourish the skin. Not only that, B12 also can help relieve stress and depression. 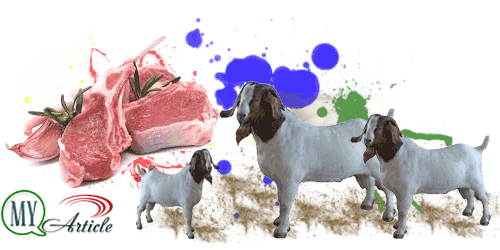 Goat meat also contains a lot of omega-3 fatty acids are effective for treating autism. Meat of goats had higher levels of potassium and sodium is low, so that it can be used to control blood pressure, prevent kidney disease, and stroke. Niacin in mutton also helps increase energy metabolism. Protein in it acts as a hunger suppressant substance that makes you feel full longer. Therefore, goat meat is also suitable to keep the weight off. Goat meat contains a lot of calcium which will help strengthen bones and teeth. In addition to the above benefits, goat meat can also help the production of cells that will delay the aging process. Mutton also helps regulate thyroid function. Well, there are many benefits that can be obtained from eating mutton instead? Therefore, do not hesitate to eat them. But if you have a tendency to hypertension and high cholesterol, you should limit the consumption of goat meat. Consult the amount of mutton which is allowed to be consumed by a doctor that does not trigger the goat meat for your health problems.